The deranged terrorist appeasing, racist loving English Democrats deputy leader, Steve Uncles, has invented some more fantasies about UKIP. First up on his new website (Wordpress closed his old one down after so many complaints about libel, impersonation and harassment) is the claim that UKIP have done a deal with the English Democrats in Kent not to stand against each other in target seats. UKIP have done no deal with the English Democrats, nor do we need to. 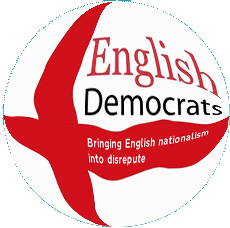 The English Democrats have 4 councillors - two of which were defecting BNP councillors - whilst UKIP has hundreds. The English Democrats have no MEPs whilst UKIP has 11. UKIP is gaining councillors all the time, the English Democrats are losing them. UKIP is on the brink of winning a Westminster by-election, the English Democrats got less votes than the Monster Raving Loony Party and the Elvis Loves Pets Party in the Eastleigh by-election. The second deranged fantasy is that UKIP have decided not to stand in the Doncaster mayoral election to give the English Democrats a free run at trying to win back the seat after current mayor, Peter Davies, resigned from their party because of the BNP takeover and links with other extremists. The press release is clear that the local membership decided not to put up a candidate against Peter Davies and risk losing the "critical check and balance against a Labour dominated council". The English Democrats are barely a blip on the political radar, fatboy has serious delusions of adequacy. In what alternate reality would UKIP feel the need to do a deal with such political non-entities as the English Democrats?